Lifitegrast is an anti-inflammatory molecule, working to reduce T-cell activation and cytokine release. Anti-inflammatories like Restasis and lifitegrast theoretically combat dry eye by breaking the inflammatory cycle. When your eye gets dry, redness and irritation result from increased inflammation on the eye's surface. This inflammation appears to reduce normal tear film function, causing more dryness and more inflammation. It is a never-ending circle of dryness, redness, and discomfort. Both Restasis and lifitegrast are T-cell modulators, but it is theorized that lifitegrast will be faster-acting than the Restasis molecule. Restasis typically requires around 3 months (the lifespan of a T-cell) to begin effectively breaking the dry eye cycle, whereas early data suggests lifitegrast will begin having effects in as early as 2 weeks. There are at this time no head-to-head studies that compare the two drugs. Potentially they could even be used in combination for a greater effect! Lifitegrast is completing Phase 3 FDA trials, and so far results have been mixed. All trials so far compare lifitegrast to placebo (the vehicle in the drug). 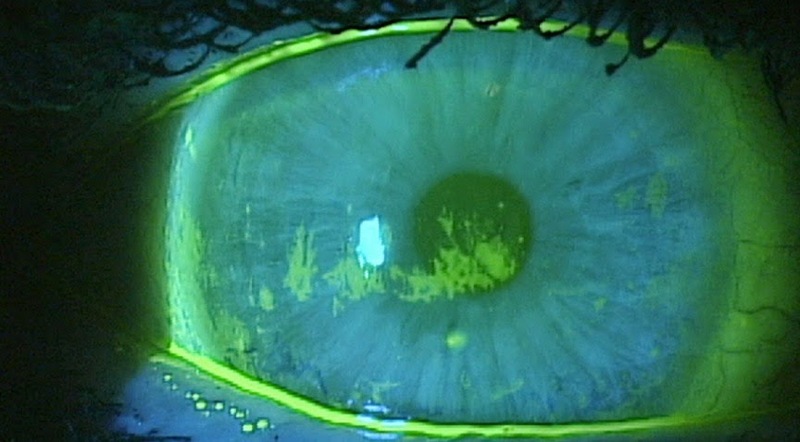 SPK or corneal staining is a clinical sign of moderate to severe dryness. In the OPUS-2 study, paitients reported a statistically significant relief from dryness symptoms with lifitegrast versus placebo. Unfortunately the clinical signs of dryness measured in the study (inferior corneal staining) was not statistically significantly improved with the use of the drug. Thus continues the infuriating issue with dry eye -- symptoms and signs of dryness tend not to coincide. So while patients felt better, the clinical findings of dryness and damage on the surface of the eye (corneal staining in this study) had not improved. In the SONATA safety study, there were no reported dangerous side effects with lifitegrast use. The most common side effect was bad after-taste (16.2% of users) and irritation after installation (7.8%). Burning with installation is also a common complaint with Restasis use. While there is no way to accurately predict when or if lifitegrast will come to market as a true alternative or additive therapy to Restasis treatment, it can be several years before a drug with successful phase 3 trials actually makes it to market. I will continue to keep you updated as we learn more! it is informative post for human.This post publish new important news.This post article is important and helpful.Thanks a lot for share your great post.